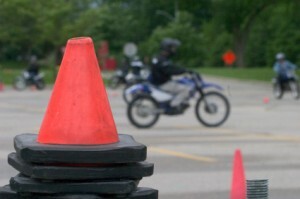 If you want to ride a Motorcycle, Scooter or Moped on a public road, you must complete a CBT course. (An exception relates to those who have a full car licence and the test was passed before 1 February 2001. These people can ride a Moped if their licence shows Category P as a Full entitlement). CBT is not a “test”, it’s a training course with a certificate at the end (DL196). The CBT certificate validates your Driving Licence, allowing you to ride Mopeds and Motorcycles for 2 years from the date of issue of the CBT certificate. You must ride unaccompanied and you cannot ride on Motorways. L plates must be displayed at both the front and rear of the machine. The content of the CBT course is laid down by the Driving Standards Agency (DSA). It contains five elements, all of which are concerned with SAFETY. At FORCE Rider Training our aim to complete our CBT course in ONE day but if you do not complete the course within the one day, worry not as we can continue your CBT and finish your training at a time to suit. Whilst riding a bike you may encounter hazardous situations, there is no sense rushing your training or short cutting the system as the only looser is YOU!! Unlike many other training schools our prices are all inclusive, – there are no hidden extras like bike hire, insurance, petrol or clothing hire. Even if you have no intention taking your test for some time, you still need to have a reasonable knowledge of the Highway Code. This is especially true of younger riders who have little or no experience of the “rules of the road”. I had a very informative and engaging day doing the CBT as a complete beginner at the tender age of 58. Tuition was professional but friendly and not intimidating. At the end of the day I felt comfortably in control on the road riding stage, a huge difference from my first nervous efforts in the morning. A fantastic day of training. Well thought out and extremely informative. Phil is a credit to the team and Force. I haven’t riden a bike for some years, however after completing my CBT with the team at Force i cannot wait to begin the next charpter of my biking life and move forward to complete my DAS with the guys at Force. Very enjoyable and successful day of CBT training, aged 56 on a scooter alongside a 19 year old chap on a motorbike. Andy did a superb job of getting us up to scratch and safely driving around a mixture of roads for a couple of hours or more. His observational skills are truly phenomenal (must have eyes in the back of his head and a telescope in front). The commentary he gave as we drove around was very instructive and educational and his stories and humour make it a truly great day out. Very professional standards but relaxed and enjoyable.